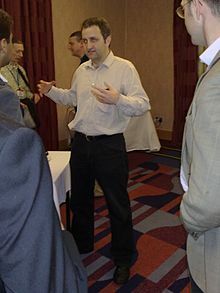 Andrei Alexandrescu (born 1969) is a Romanian-American C++ and D language programmer and author. He is particularly known for his pioneering work on policy-based design implemented via template metaprogramming. These ideas are articulated in his book Modern C++ Design and were first implemented in his programming library, Loki. He also implemented the "move constructors" concept in his MOJO library. He contributed to the C/C++ Users Journal under the byline "Generic<Programming>". Alexandrescu worked as a research scientist at Facebook, before departing the company in August 2015 in order to focus on developing the D programming language. He became an American citizen in August 2014. Alexandrescu received a B.S. degree in Electrical Engineering from Polytechnic University of Bucharest (Universitatea Politehnica din Bucureşti) in July 1994. His first article was published in the C/C++ Users Journal in September 1998. He was a program manager for Netzip, Inc. from April 1999 until February 2000. When the company was acquired by RealNetworks, Inc., he served there as a development manager from February 2000 through September 2001. Alexandrescu earned an M.S. (2003) and a Ph.D. (2009) in computer science from the University of Washington. More recently, he has been assisting Walter Bright in the development of the D programming language. Alexandrescu released a book titled The D Programming Language in May 2010. From 2010 to 2014, Alexandrescu, Herb Sutter, and Scott Meyers ran a small annual technical conference called C++ and Beyond. Expected is a template class for C++ which on the C++ Standards track. Alexandrescu proposes Expected<T> as a class for use as a return value which contains either a T or the exception preventing its creation, which is an improvement over use of either return codes or exceptions exclusively. Expected can be thought of as a restriction of sum (union) types or algebraic datatypes in various languages, e.g., Hope, or the more recent Haskell and Gallina; or of the error handling mechanism of Google's Go, or the Result type in Rust. int parseInt(const string&); // Returns 0 on error and sets errno. Andrei Alexandrescu (February 2001). Modern C++ Design: Generic Programming and Design Patterns Applied. Addison-Wesley. ISBN 978-0-201-70431-0. Herb Sutter, Andrei Alexandrescu (November 2004). C++ Coding Standards: 101 Rules, Guidelines, and Best Practices. Addison-Wesley. ISBN 978-0-321-11358-0. Andrei Alexandrescu (June 2010). The D Programming Language. Addison-Wesley. ISBN 978-0-321-63536-5. ^ a b Metz, Cade (7 July 2014). "The Next Big Programming Language You've Never Heard Of". Wired.com. Wired. Retrieved 27 July 2014. Today, Alexandrescu is a research scientist at Facebook, where he and a team of coders are using D to refashion small parts of the company's massive operation. ^ Alexandrescu, Andrei (1 February 2003). "Move Constructors". Dr. Dobb's Journal. Archived from the original on 7 May 2009. Retrieved 25 March 2009. ^ "Moving forward with work on the D language and foundation". 25 August 2015. Retrieved 28 August 2015. ^ Reddit.com: "Sixteen years ago, at 28, I landed in New York with $300 to my name. Today I became a US citizen. It's been a wild ride that I hope will go on!" ^ Computer Science & Engineering, Recent Ph.D. Graduates (Summer 2009). University of Washington. ^ [ Botet; Talbot. "A proposal to add a utility class to represent expected monad" (PDF). Archived from the original (PDF) on 19 August 2014. ^ Alexandrescu. "Systematic Error Handling in C++". Alexandrescu's homepage - Contains links to downloadable Loki libraries for various compilers.